Click here to find out more about Manchester Fayre, their services to schools, nutritional standards and their menus. Our menu is based on a 3-week cyle. The menu changes every day for a three-week period and then repeats after three weeks. There is an autumn/winter and a spring/summer menu. The cook does have some flexibility in deciding what to cook, taking the children’s preferences into account, as long as it meets Manchester Fayre’s nutritional standards. Children in Early Years (Nursery and Reception) have the Cook’s Choice 1 every day. This is because we feel that our youngest children will benefit from a hot balanced meal. Current menus are available from the school office. The children pre-order what they want at least 3-4 days in advance. This ensure that the team cooks enough of the hot meal and prepares enough sandwiches of different fillings so that children are not disappointed, particularly those who find themselves on the ‘last sitting’ of the lunchtime. The school charges for school meals and parents must may this charge in advance. The school operates a no-debt policy with regard to school meals. The charge for school meals can be found on a Charges and Remissions page. School meals must be paid for in advance, preferably through Parent Pay. When a child is absent, parents will receive a credit for that day which will be offset against future payments. Refunds are only offered at the end of each term or when a child no longer requires a school lunch. At this time, all children in reception, Year 1 and Year 2 are entitled to a free school meal, regardless of any entitlement due to a family claiming benefits. Children in other year groups, including nursery, may be entitled to a free school meal if their parents are receipt of certain benefits. Please ask at the school office or click here for more information. Parent who are in receipt of benefits are asked to apply for Free School entitlement even if their child does not have a school meal. This is because the school receives additional funding for every child who is entitled to free school meals. Our school cook and her team pride themselves on maintaining a very clean and hygienic cooking, preparation, storage and serving environment. 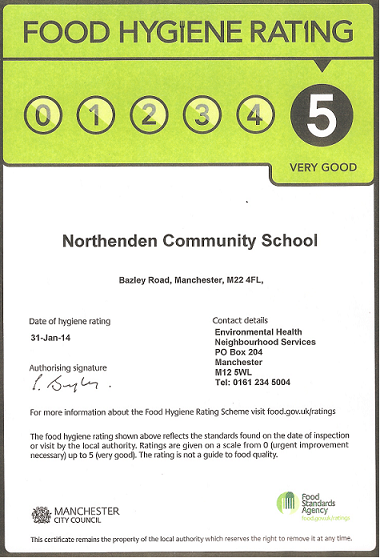 We are inspected regularly by the Local Authority (Environmental Health) and are proud to achieve the highest FOOD HYGIENE rating as shown in the certificate below.